We had a lovely dinner at Woodnotes Grille at the Emerson Resort & Spa in Mt. Tremper, New York located in the heart of the Catskill Mountains, where the restaurant's focus is on "Catskill Creative Cooking." The delectable Woodnotes Grille menu features many New York state and Catskill Mountain local products, a nice selection of New York State wines in addition to United States and international wines, well-crafted artisanal cocktails, and excellent service, which made our experience at the restaurant most pleasurable. We had dinner at Woodnotes Grill on Friday, August 24, 2018, where the ambience was contemporary, comfortable, and inviting with attractive Danish lighting softly illuminating the restaurant. 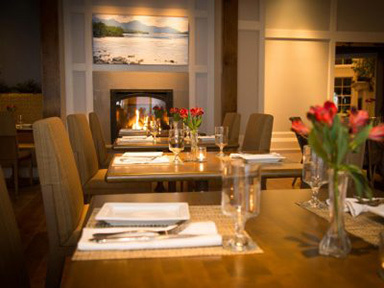 A key focal point of the restaurant is the attractive fireplace and seating area flanked by white wooden planters lushly planted with anthurium, perfect for enjoying an after-dinner cocktail or coffee. 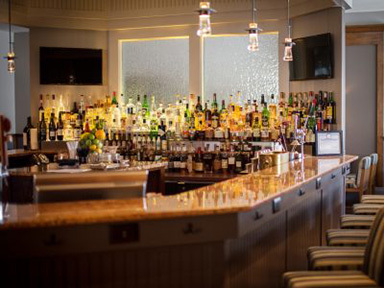 The restaurant has a well-stocked bar area where guests can enjoy a drink or have light fare. 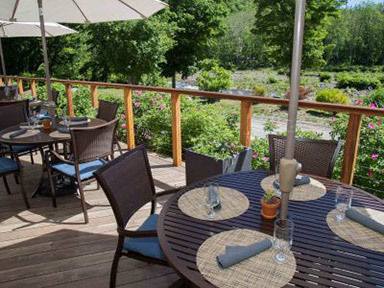 Taking advantage of its location by the Esopus Creek, the restaurant also has a spacious deck for al fresco dining where diners can listen to the water rushing over the rocks and soak up the beauty of nature while dining. Woodnotes Grille prides itself on its interesting cocktail menu of well-crafted cocktails consisting of classic cocktails like the Daiquiri, Cosmopolitan, Margarita, and the like, as well as innovative modern cocktails. We began our evening with one of their handcrafted cocktails named The Paper Airplane, a delicious libation made with Medley Bros. Bourbon, Amaro Nonino, Aperol, and lemon, which was perfectly balanced, decadently tasty, and a great introduction to the talent behind the bar. Our dining experience at the Woodnotes Grille began with two of the starters listed on the menu, the Fried Calamari and the Smoked Gouda Fondue. 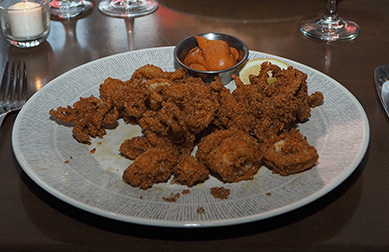 The Fried Calamari was presented with smoked paprika aioli, pickled cherry peppers, and a lemon wedge. Delicately coated with cornmeal, the calamari were fried to golden perfection, and melted in our mouths. 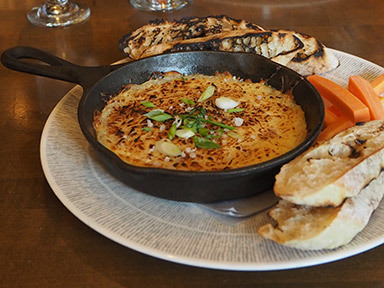 The Smoked Gouda Fondue was not traditional fondue, but rather their delicious interpretation, presented in a small cast iron skillet accompanied by grilled baguette slices and carrots to scoop up the melted cheese. The restaurant has a nice selection of wines by the bottle as well as by the glass, and we paired our starters with a glass of 2017 Domaine Du Salvard, Cheverny, from Loire, France, which was an elegant, lovely, and crisp wine with nice minerality made with Sauvignon Blanc grapes that complemented the calamari and the smoked gouda fondue. With the restaurant's focus of "Catskill Creative Cooking," for one of our entrées, we decided that we wanted to eat local. 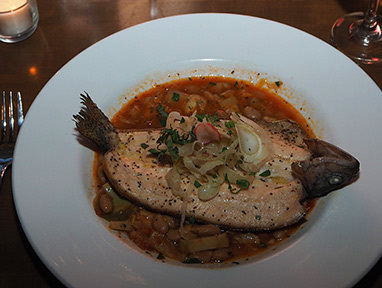 As Woodnotes Grille is in the Catskill Mountains in an area prized for its trout we had the Beaverkill Trout paired with a spring vegetable white bean stew, shaved fennel and radish. Locally caught, the trout was butterflied and deboned, then pan-seared and finished in the oven, topped with the stew, and was an excellent choice. For our other entrée, we had the Faroe Island Salmon paired with arugula-dill spaetzle, braised red cabbage, and crispy caper brown butter. The salmon was perfectly cooked and presented with its crispy skin topped with capers. 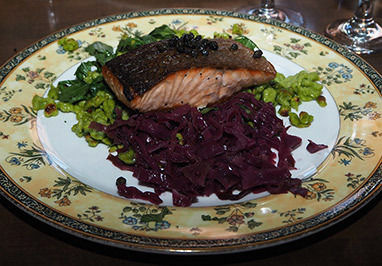 The flavors worked well for this colorful dish with the al-dente spaetzle and sweet red cabbage acting as perfect companions to the buttery salmon. 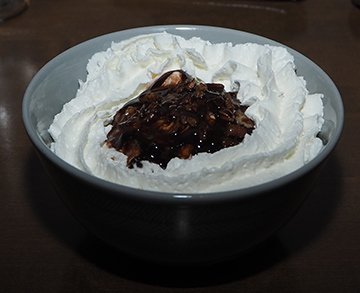 We ended our dining experience on a sweet note with locally made sour cream ice cream decadently drenched in chocolate sauce and cherries and generously topped with fresh whipped cream and pecans. As it was a beautiful summer night, after our dinner we relaxed outside on the attractive Woodnotes Grille deck where a roaring fire in the firepit beckoned invitingly to us to sit and linger and make the evening last and savor the experience just a little bit longer. Read about our hotel experience at the Emerson Resort & Spa in the Hotels and Resorts section. Read more about The Catskills in the Destinations and Adventures section.